A "Tournament of Roses" rose, seen here with astronaut Rex Walheim, floated in Earth orbit in February 2008 before riding on a float in the 2009 Rose Parade. Almost four years after Rex and Lance Walheim collaborated to launch a rose into space for the annual Tournament of Roses Parade in Pasadena, Calif., the astronaut and horticulturist brothers have landed on one of the 2012 Rose Parade floats. On Jan. 2, the Walheims will be riding on a flower-adorned float styled to tell their story about growing up working in the family garden near San Francisco, and "dreaming what could be." Sponsored by Bayer Advanced, the consumer lawn and garden company where Lance works as a rose care expert, the "Garden of Imagination" float was inspired by the parade's official theme for 2012: Just Imagine. "That started the process that about 30 years later found me flying over that same house in San Carlos 200 miles up in space traveling 25 times the speed of sound," said Rex. Rex's older brother Lance imagined working with flowers and plants. Now he is a horticulturist, and has authored and co-authored more than 30 books, including the best seller, "Roses for Dummies." He provides gardening advice to millions of people each year. The original idea for the float came from Lance discussing his and his brother's childhood experiences. Artist’s concept of the Bayer Advanced “Garden of Imagination” 2012 Rose Parade float that will feature NASA astronaut Rex Walheim and his brother Lance, a celebrated horticulturist. The Garden of Imagination float uses more than 20,000 roses — including the debut of an award-winning yellow rose titled "Sunshine Daydream" — to form a garden that blends into the 30-foot-high (9-meter-high) contrail of a launching rocket. "The thousands of flowers on the Bayer Advanced Garden of Imagination float are symbolic of the ideas that grow in your imagination, just like the ideas Rex and I had growing up," Lance said. "Imagination is at the heart of our creativity. It allows us to think beyond what we are used to in everyday life and gives us faith and excitement about the future," he said in an interview with collectSPACE.com. It was imagination that first led the brothers to collaborate for the Rose Parade in February 2008. Making his second of three trips into space, Rex brought with him a two-toned pink rose — appropriately titled "Tournament of Roses" — that Lance picked for the 5.3-million-mile (8.5-million-kilometer) trip. That rose, which was featured on Bayer Advanced's 2009 float, won't be making a repeat appearance. 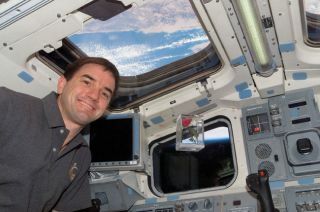 "I have the original rose [that was] shown floating in the space station," Lance said. "Unfortunately, it is so fragile, we won't be moving it." Both Lance and Rex attended the parade in 2009, but this will be their first time riding on one of the floats. "This is definitely one of the coolest things I've ever had a chance to do," Rex said. "So cool, in fact, that we bought airline tickets for my boys so they can come out to watch the parade for the first time too." So at an event so focused on flowers, who do the brothers think will attract more attention — the only astronaut in the parade or the celebrated horticulturist? "Easy — Rex," Lance said. "Very few people get to go to space, let alone three times. I think everyone knows and respects what kind of courage and commitment that takes. And they want to know what it is like." "I just get dirty and everyone knows what that's like," said Lance. But his astronaut brother disagreed. "I have to play second fiddle to my older brother Lance. He has the useful knowledge that everybody likes," said Rex. "I even have to call him from time to time to ask him how to cure the latest pestilence in my backyard. No one calls me up and asks me to help them fix their personal space station, so the usefulness of my knowledge base is limited." "But, if I could get my 'Garden Boy' brother up to the International Space Station, I bet he might ask for some spacewalking advice if we had to go work in the backyard up there!" Rex said. Watch for the Walheims and the Bayer Advanced Garden of Imagination float on ABC, NBC, Hallmark Channel and other networks' live broadcasts on Jan. 2, 2012, between 11:10 and 11:20 a.m. EST. Click through to collectSPACE.com to see photos of the Bayer Advanced "Garden of Imagination" float as it was being prepared for the 2012 Rose Parade.